and here another one! but can't find the name of the white car!! who can find the name??? Hi Pierrick. The white car looks like a more grown up version of a Newmap Rolux, the nose and front mudgaurds are the same shape. I have never seen one like this before. Not sure but i think it's an ELECTROLETTE. i did find a nice page on internet and a picture of an electrolette...in Italy to Mister Mivalino. very nice museum. look at the tires on the electrolette ! On that last posting chavattov gives a link to Flickr. On the thumbnails to the right click 4 or five times and what do you see? I don't know how to download from there but could this be the car Tony is asking about in RCN 99s editorial? His contact sent a drawing and this looks pretty similar. The moto car is fantastic. when i do compare the two pictures i am not shure that it can be an Electrolette! the front it not exactly similar! about the Microbo, an article in the last book of Jan de Lange " microcars stories" Drivers edition say: " The 125cc microbo (1952-1954) was an italian design, but in 1953 it was advertised as being produced in France. 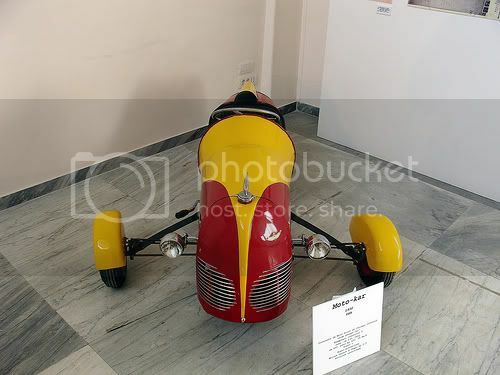 it is unlikely that it was ever built in france and very few were made in italy; this is the second-generation model, show at the turin motor show of 1953 "
here a links to see another Mota car! I agree, it looks nothing like an Electrolette, I was going to say this before but thought you French guys must know best. I still think its a rare model Newmap.